The full moon of February is known by various names – Snow Moon, Wolf Moon and Hunger Moon (Northern Hemisphere) and Grain Moon, Sturgeon Moon, Red Moon, Wyrt Moon, Corn Moon, Dog Moon and Barley Moon if you live in the Southern Hemisphere. I’m in the Northern Hemisphere and Wolves are a bit thin on the ground here in Scotland. I don’t have any snow (at the moment) and since I’m in the throes of trying to cut down on the amount that I’m eating, I thought I’d plump for the Hunger Moon! Who helps me successfully handle my hunger pangs from now until the next full moon? 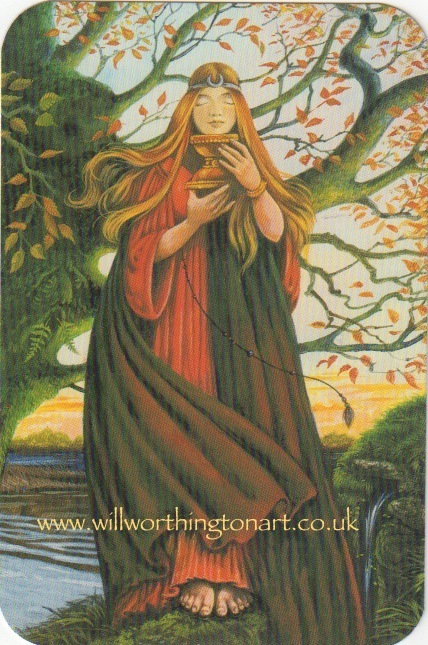 The answer comes in the form of the Druidcraft Tarot’s Princess of Cups. In this deck, the usual Page is replaced with a Princess, but she serves the same role. 1 She has her eyes closed – don’t drool over gorgeous food when it’s a fast day. 2 She holds a cup – drink plenty of fluids and make them as interesting as possible. 3 She’s outdoors – get outside whenever I feel hungry. 4 I like her clothes – focus on treating myself to a new item of clothing when I am less portly. Honestly, just a few inches off my bosom and belly would be GREAT. So much for how she looks, but what might her Tarot meaning contributes to my successful wrangling of my hunger? How else can the Princess of Cups help me with my hunger pangs? What do you think? Better crocheting a square than tucking in to Salt and Vinegar crisps! !